The "ORPHEAS" company, in its attempt to expand its business activities, has established in 2006, as a branch, an ultra-modern oil mill. It is located at the Myrtofyto industrial area, at a small distance from the company’s headquarters, in a building of 740 m2 owned by the company. The equipment of the oil mill is of the globally leading company PIERALISI, certified in compliance with strict production and safety standards. More particularly, it has two decanters, two separators and twelve mixers, offering thus a 5-6 tons per hour potential of olive pressing. The entire procedure is performed with ultra-modern mechanical methods (centrifugation). It also has three stainless tanks, suitable for greasy foods, of a capacity of 15 tons each, for the safe storage of olive oil. The oil mill owns trucks that are used for the transportation of olives from the olive groves when this is required. 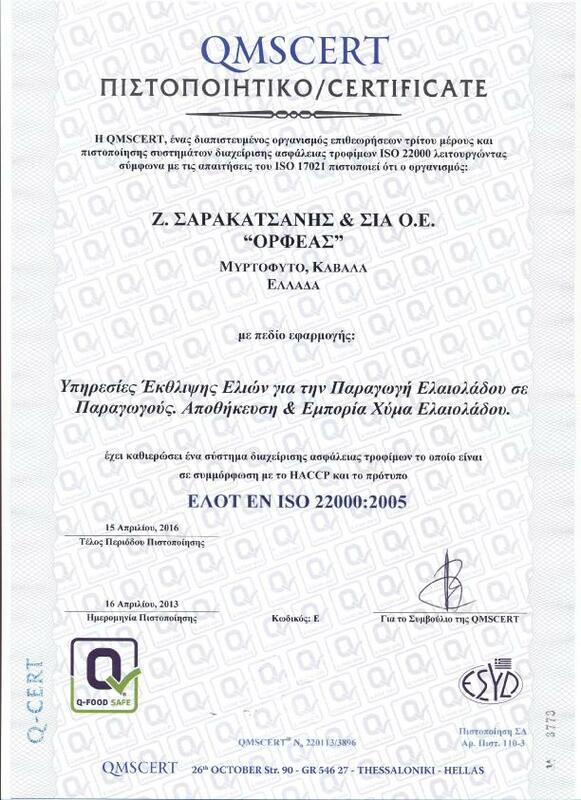 Particular attention must be paid to the strict compliance with the Greek Food Code, as well as to the application of the ISO 22000 system in all of the stages of the production process. Its permanent and seasonal staff have a great experience and are fully skilled in order to meet the needs of the oil mill. The company’s goal is to fortify its important position in the sector of production of olive oil in the area, but also to be further expand and develop in other relevant sectors, such as the standardization and export of olive oil.